From bumpy off-roads to weekend projects, the 2019 Toyota Sequoia tackles it all with confidence all while keeping the cabin comfortable. The Sequoia’s brawny body-on-frame construction, powerful V8 engine and fine-tuned suspension give the SUV the athletic prowess to handle any obstacle. Whether you’re exploring dusty country roads or your favorite state park, the 2019 Toyota Sequoia is the perfect SUV for any adventure. Choose from multiple trims, including the SR5, TRD Sport, Limited and Platinum model, each of which comes equipped with a generous array of premium features. The 2019 Toyota Sequoia’s large interior provides a quiet, relaxing space with seating for up to seven people. The plush seats, tri-zone automatic climate control, third-row retractable sunshades and power-adjustable driver seat add another level of luxury to the high-end cabin. The world is your oyster when you’re behind the wheel of the 2019 Toyota Sequoia. Explore to your heart’s content with confidence knowing that the Sequoia will take you where you need to go. In fact, it’s the SUV’s incredible utility and functionality that make it a must-see. At the heart of every 2019 Toyota Sequoia is a 381-hp, 5.7-liter V8 engine paired with a six-speed automatic transmission. Rear-wheel drive is standard, but four-wheel drive is available as an option. Whether you are running errands or are towing to the 7,000-pound capacity, you can count on the Sequoia to keep the cabin comfortable. Test drive the new 2019 Toyota Sequoia at Le Mieux Toyota today! How will you build your 2019 Toyota Sequoia? Choose from a variety of entertainment and convenience technologies. Even the base model is standard with a long list, including a sunroof, a power rear window, LED headlights, a 6.1-inch touchscreen, an eight-speaker audio system with a CD player, satellite and HD radio, Bluetooth and much more. 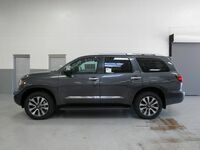 All 2019 Toyota Sequoia models are also standard with forward collision warning with automatic emergency braking, lane departure warning, a rearview camera, rear cross-traffic alert and traffic-adapting cruise control. Perhaps the best way to explore all the features and capabilities of the new 2019 Toyota Sequoia is with a test drive. Our award-winning experts can answer any questions you might have and help you find the perfect vehicle for your budget and style. Stop by and see us today!